The Islamic State has taken hundreds of hostages as it falls back into its Iraqi stronghold of Mosul, bolstering its inventory of civilian human shields with 295 Iraqi Security Forces troops kidnapped last week. Meanwhile, the discovery of a mass grave filled with headless bodies offered another reminder of the horrors awaiting prisoners of ISIS. “People forcibly moved or abducted, it appears, are either intended to be used as human shields or – depending on their perceived affiliations – killed,” said Ravina Shamdasani, a spokeswoman for the U.N. High Commissioner for Human Rights, as quoted by Reuters. The Iraqi Security Forces officers were kidnapped in several separate attacks between November 1st and 4th. 30 sheikhs were also taken on November 2nd or 3rd, along with some 1,500 civilian families forced to join ISIS fighters as they retreated to Mosul from the town of Hammam al-Alil. On Monday, the Iraqi military reported finding about 100 decapitated bodies in a mass grave south of Mosul, near an agricultural college in Hammam al-Alil. Fox News reports a forensics team from Baghdad is en route to investigate the mass grave. The remains were said to be too badly preserved to tell for certain if they were soldiers or civilians. Baghdad officials said separate attacks in different suburbs of the capital have killed at least 14 people and wounded 43 others. Police said the deadliest among Monday’s attacks unfolded in Arab Jabour in southern Baghdad when two mortar rounds landed in a residential area, killing four civilians and wounding 11 others. In the western suburb of Abu Ghraib, three roadside bombs hit an Iraqi army patrol, killing an officer and two soldiers and wounding eight troops, police added. Other attacks targeted anti-ISIS Sunni tribal fighters, a checkpoint and two outdoor markets. 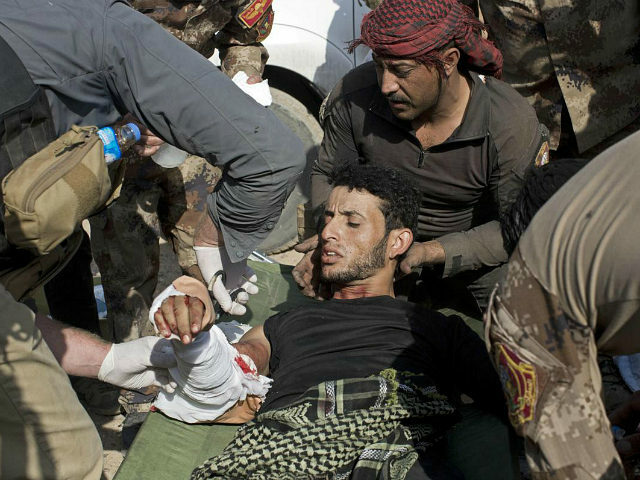 On Sunday, a pair of suicide attacks using ambulances killed at least 11 people in Samarra and 13 in Tikrit. The Samarra bombing occurred near a religious shrine, killing a number of Shiite pilgrims. ISIS claimed responsibility for both attacks.